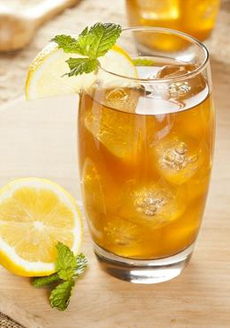 This month, it’s about cold infused tea—the opposite of sun tea. As with sun tea, you simply add tea to water; but you place the container in the fridge, not in the sun. “Conventional iced tea is a strongly brewed serving, poured over plenty of ice,” says In Pursuit Of Tea founder Sebastian Beckwith. “But there’s another method—cold infusion—that produces an incredibly [naturally] sweet, full-flavored glass with any loose leaf tea—black, green, white or herbal. Why would you want to brew tea in the fridge rather than the conventional way—steeped in boiling water? To bring out subtle nuances in the flavor of your tea. If you’re not a volume quaffer of iced tea, this method lets you make 1-2 servings a day, without taking the time to boil, steep, cool, strain and then refrigerate. Can you use tea bags? This type of brewing brings out the flavor notes in top quality tea. If you have some truly excellent tea bags, try it (use two bags). 1. STIR tea into cold water. Refrigerate for 4-6 hours. For a stronger brew, add 1-2 hours to infusion time. Cold infused tea is the opposite of sun tea, where one places tea bags and water in a glass or plastic container. The container is placed in the sun for several hours, where solar heat brews the components into a weak tea. This has historically been a method of necessity, not of choice—for example, with campers. Fine tea needs a fast infusion of boiling or near-boiling water to fully release its aromatic oils and to create a hearty brew. Or now, a cold infusion.